Psychexplosion! Sumireko topdecks into Danmaku!! Do you always have a Voile handy for Lily White? Do you topdeck into 1 Up three times in a row? Does Supernatural Border read “You win the game” to you? Well we’ve got a character card for you. 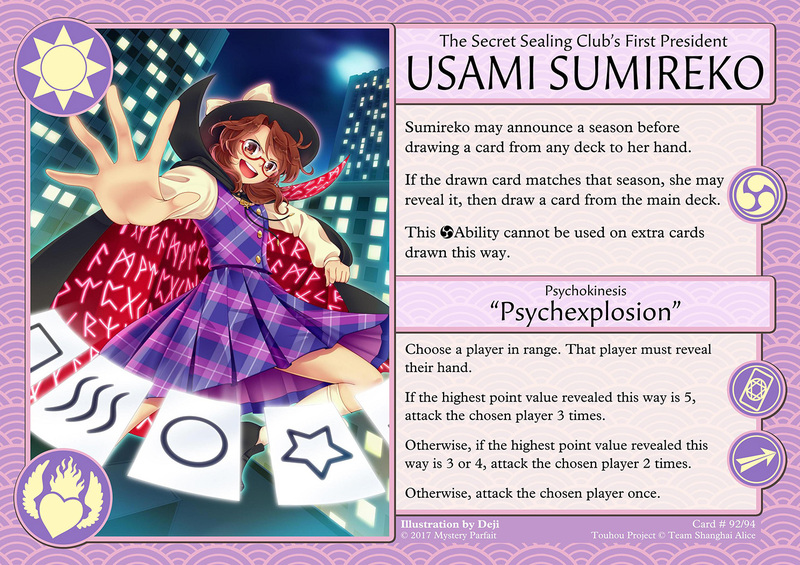 Introducing the first Sealing Club president, Usami Sumireko! 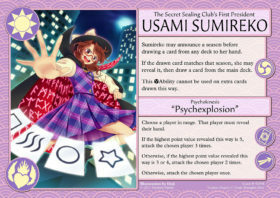 Sumireko allows you to use your psychic powers to win hard in Danmaku!! Average monkeys only get a 33% extra card draw out of her, but with your abilities 33% sounds like 100% doesn’t it? Her spell card furthers these abilities, by reading the cards in your opponents hand, you can know just when to strike. Today is a special day for us. It’s been one year since we released Danmaku!! 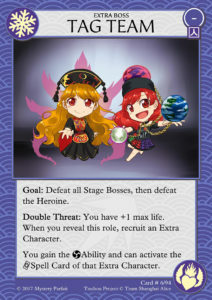 To celebrate we’re putting the base game on sale, and showing off a new expansion character card and a new expansion role, both of which use Lunatic Extra’s new mechanic: Extra Characters. Additionally(!) we will be opening playmat preorders very soon(tomorrow). There will be Lunatic Extra characters and art available for playmats. The preorder period will last for 3 weeks. Like last time we will keep the top 10 most popular playmats in stock for some time. Enough about that, here are today’s releases, along with the Extra Character rules. 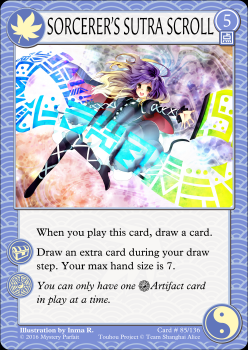 Some cards in Lunatic Extra allow you to have more than one Character card at the same time. While every player has just one Character, a player may gain one or more Extra Characters, allowing a player to use the Abilities or Spell Cards of those Extra Characters. You gain Extra Characters when a card tells you to recruit an Extra Character. 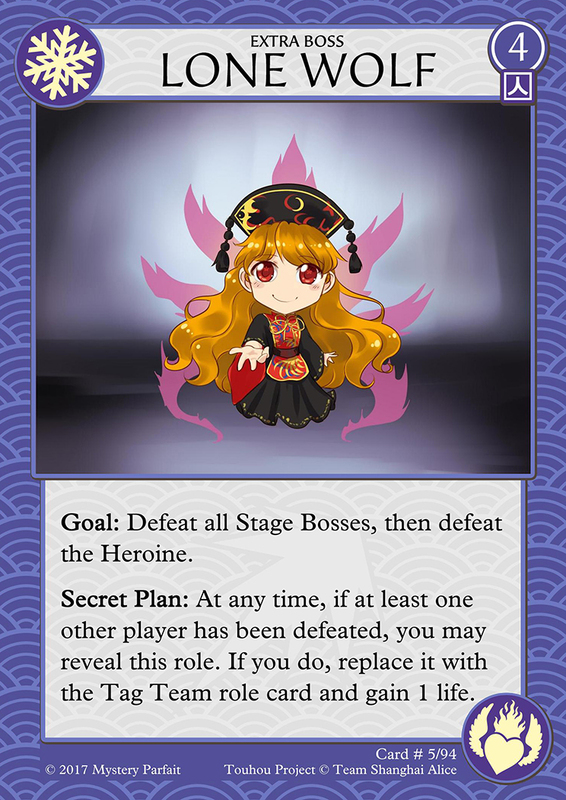 To recruit an Extra Character, you shuffle all of the unused Character cards, and draw two. Look at those cards and choose one to keep. That Extra Character has now been recruited. Put the other Character card back in the unused character pile. 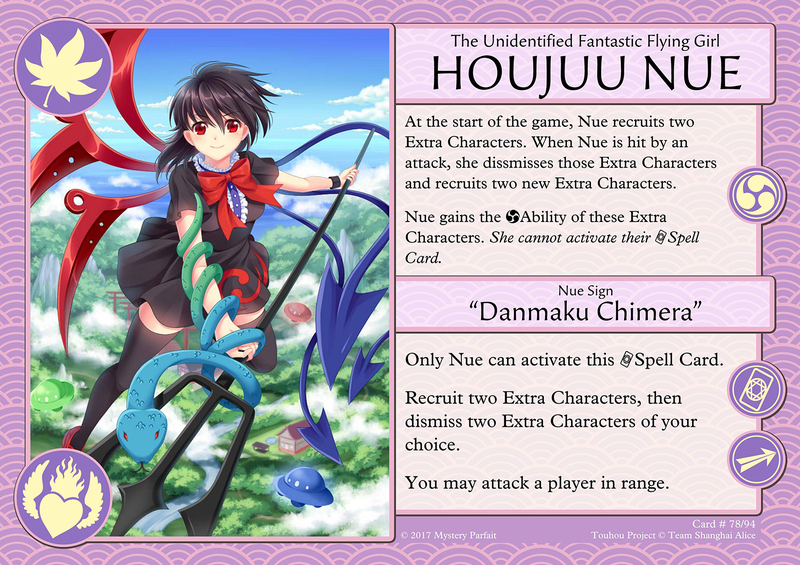 The card that tells you to recruit an Extra Character will specify whether you gain that character’s Ability, Spell Card, or both. You lose an Extra Character when a card tells you to dismiss an Extra Character. When you dismiss an Extra Character, shuffle that card back into the Extra Character pile. There is no discard pile for Extra Characters, so you can potentially draw that character again later in the same game. 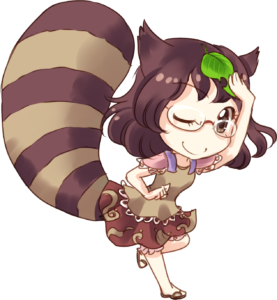 There are several ways to get an Extra Character: your role (Tag Team), your character’s Ability (Houjuu Nue), or certain Items (Tanuki Leaf). You can have more than one of these at the same time, meaning you can potentially have many Extra Characters all at once. Each card that grants you an Extra Character works independently. Remember which Extra Character is associated with each source. If one source gives you an Extra Character’s Ability, it only counts the one you recruited from that source. If that source tells you to dismiss your Extra Character, you only dismiss the Extra Characters granted by that source. Effects that tell you to choose a player or their Character do not allow you to choose Extra Characters. For instance, you cannot use Capture Spell Card to activate the spell card of an Extra Character. Today it is Setsubun in Japan, a festival where you invite happiness into your house by driving out the Onis. Well, we have an Oni that refuses to be driven out – the most powerful of all Youkai and unexplainable phenomenon, Hoshiguma Yuugi! 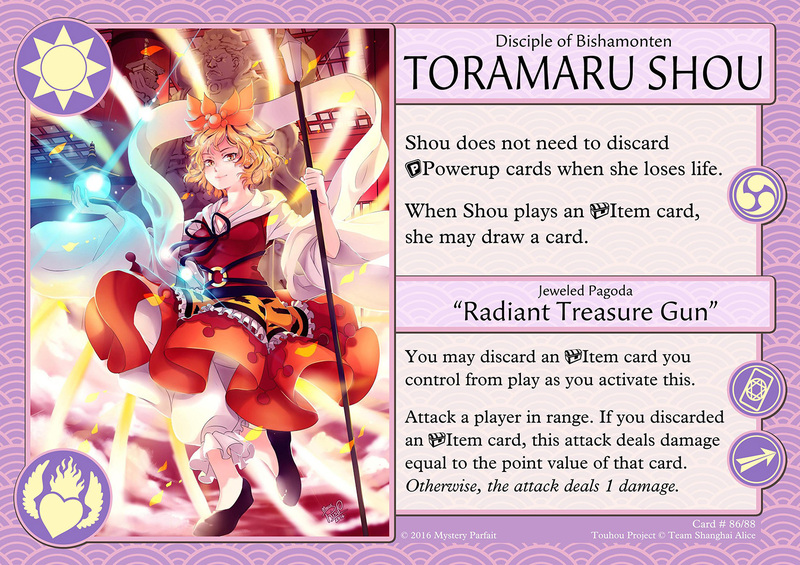 Today we also have another fierce god, Toramaru Shou, personification of Bishamonten and tiger youkai. She will show you the hidden power residing in all artifacts, large and small. 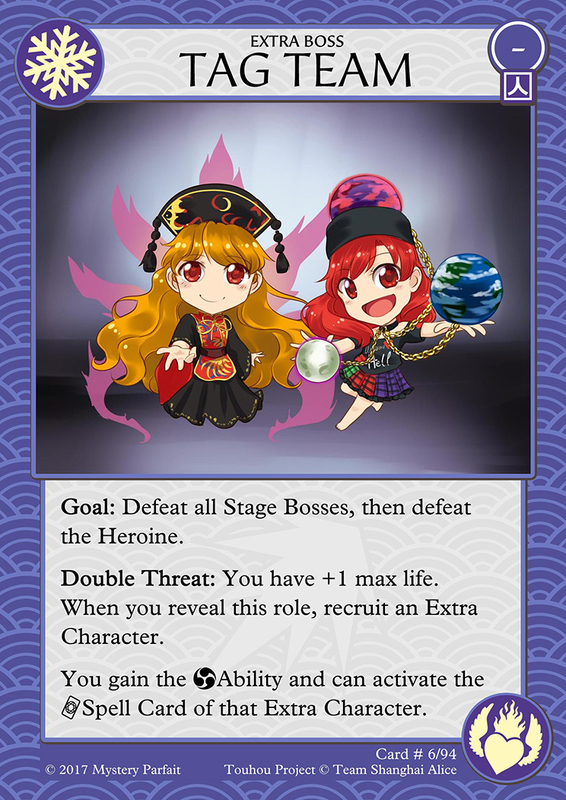 Both characters will be available in the Lunatic Extra expansion! Rise again in 2017 – Mokou joins Danmaku!! 2016 was a rough one wasn’t it? However, in the year of the Rooster we must go back to our Mythical roots and rise like the phoenix! Perhaps a mysterious elixir from the moon will help, or maybe you’ll regret your decision for the rest of your unnatural life…nah. 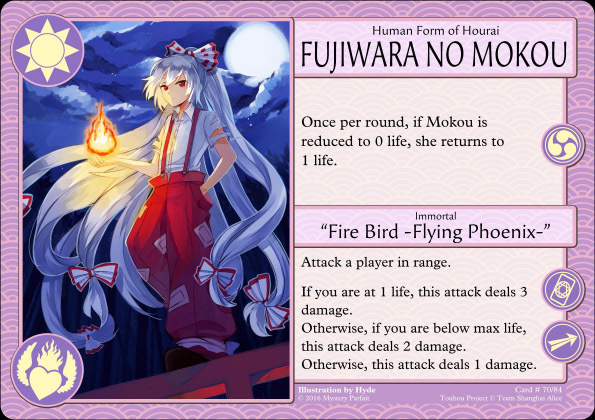 Fujiwara no Mokou joins Danmaku!! as a risk & reward character. 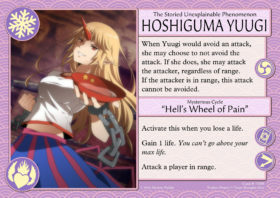 Her Spell Card gets more powerful the lower her life total is, and her Ability lets her hang out at low life without immediately being defeated. You aren’t completely invincible as Mokou though, you’ll have to judge where to keep your life total. Also watch out for pesky ghost princesses. Danmaku!! Card Database is Live! Our industrious kappas have been busy this holiday season, and after several weeks of hard work, we are proud to finally announce the newest feature to the Danmaku!! website: the Danmaku!! Card Database! The Card Database contains detailed information on every card in the game. This lets you see if there are any changes to the text of the cards, as well as read detailed answers to common and not-so-common scenarios that came up. If you ever had to stop a game of Danmaku!! 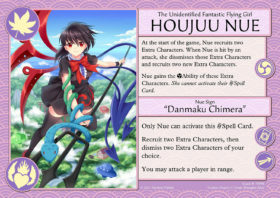 to ask what is really supposed to happen when a certain character plays a certain card, just look it up on the Danmaku!! Card Database. Draw an extra card during your draw step. Your max hand size is 7. You can only have one Artifact card in play at a time. I you have a question that isn’t answered on the related card’s FAQ page, please email us with a detailed question and we will be happy to answer. 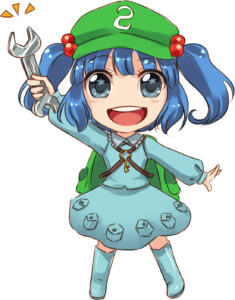 Not only will this help you out, but it will help build a more comprehensive FAQ, meaning the Card Database will be better equipped to help others with the same problem in the future. Check out the Card Database now!